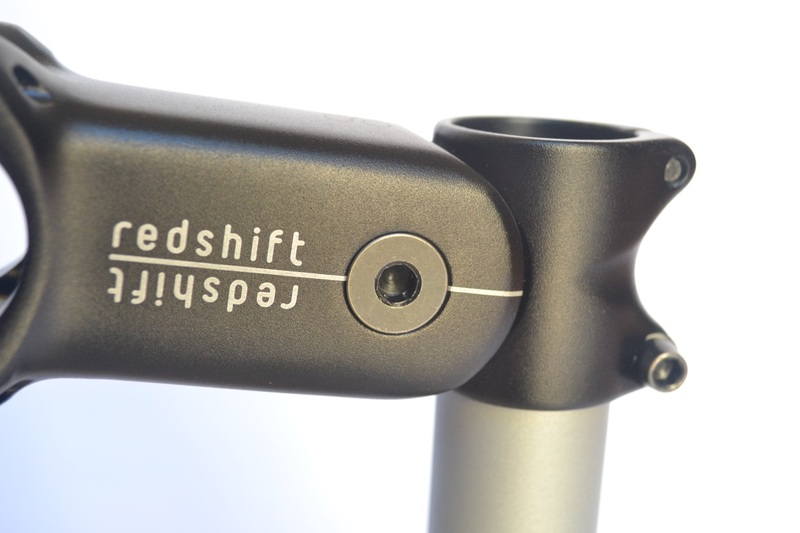 The protagonist of this test is a stem; the ShockStop manufactured by the American “Redshift Sport”, that hides a secret inside: it is amortized. When I saw it the first time on the net, few months ago, on the occasion of the launch of the fundraising campaign on Kickstarter, I must confess I was not particularly impressed. It is not a new idea, they tried for years to “spring” this component with disappointing results – all things considered – both functionally and aesthetically. A tough test was the Paris – Roubaix, where “Bianchi” tried a stem of 3TTT with a shock absorber with helicoidal spring and oil. The pattern, with an external absorbing element, continues to be offered on more modern models. “TranzX” is one of the few companies which presents an internal absorption system, but since I have not tested it, I cannot comment on that. 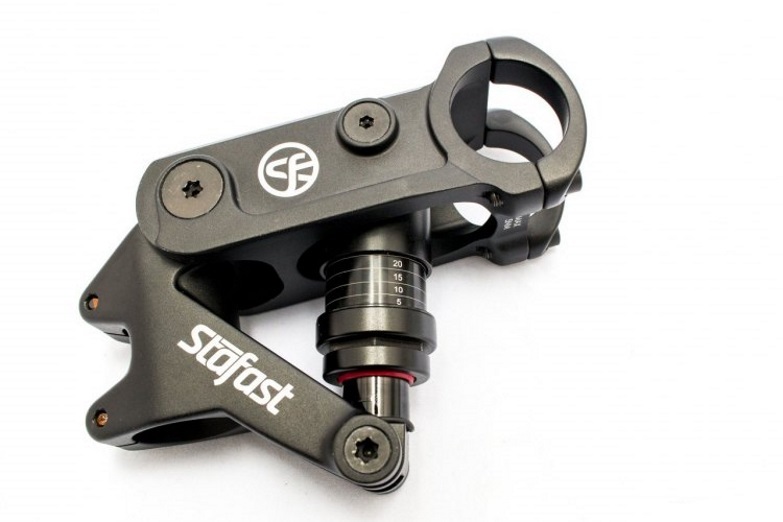 And then we have this ShockStop, which uses a single pivot system on bearing and internal elastomers, available in different shades, to be calibrated according the rider’s weight. Before facing the detailed knowledge of this stem, we should go over some basic notions, because, on certain aspects, many cyclists continue to follow urban legends, confusing the rigidity of a frame and of a bike in general with its absolute best performance. In reality, it’s not like that. Under the pressure of the force exerted on the push thrust the whole bike flexes; and when I talk about the whole bike, I mean the frame, wheels, seatpost, stem: everything in a word. The bending is necessary, otherwise it would break; each bending involves a power absorption, and if it increases, more energy will be dispersed. The professionals ask for more and more rigid frames, they don’t care about the duration and even less about the comfort: not even a single watt must be dispersed. The amateurs follow hot on the wheels, of course only metaphorically. The rigidity requires a price: if it does not disperse the energy of the push thrust in the same way, it will not disperse the energy coming from the road. Perhaps only the velodromes have a perfectly smooth paving, on the road, it never occurs. This energy, that I will call “in return”, in order to simplify my description, is not an inconvenience factor: it removes some strength from the cyclist. That’s why I always do not recommend too rigid bikes to those who are untrained. The nightmare of every designer is to create a bike that is rigid in the transmission of the push thrust, and soft in the reverse answer. Until the bikes were built only in steel, they relied on geometries; then the metallurgy progress arrived, with the tubes with variable sections, different alloys, and something changed. The leap forward was in recent years, with the improvement of composite fibers, where, working on the texture and the material of the frames as well as on the geometries, we have some bikes that disperse the push thrust a little or not at all, and – at the same time – keep the cyclist out of shocks. As I said affect the comfort, exhaust you and, I can add, are dangerous too. Any of us, who had to face a particularly difficult stretch of paved road, was forced to slow down, not only to safeguard his back, but also because keeping the bike in trajectory is impossible. 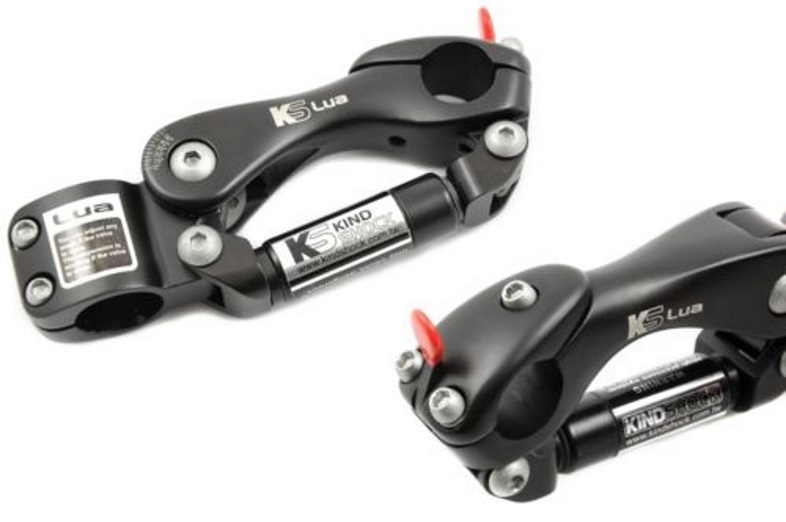 Think of the Mountain bike: front or full suspended, these shock absorbers simply serve in order to comfortably cycling or keeping the bike on (off) the road? 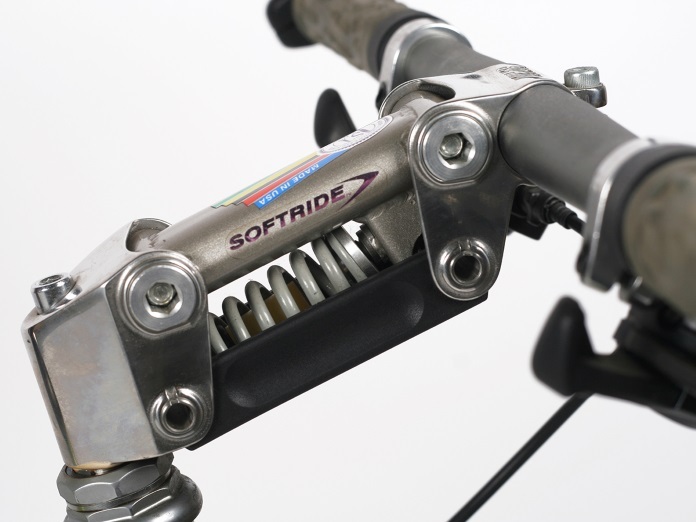 Could you imagine what would be riding a bike or a car without suspensions? At the firs hump it would take off, at the first curve you would be off-road. Equipping a MTB or a a all-terrain light bike such as a trekking one with a damping system, is a natural choice. With a road one, things get complicated; with a sport one, it becomes very difficult (there are examples, I know, but for now are isolated cases) and the explosion of gravel phenomenon is giving a boost to the search of effective solutions. 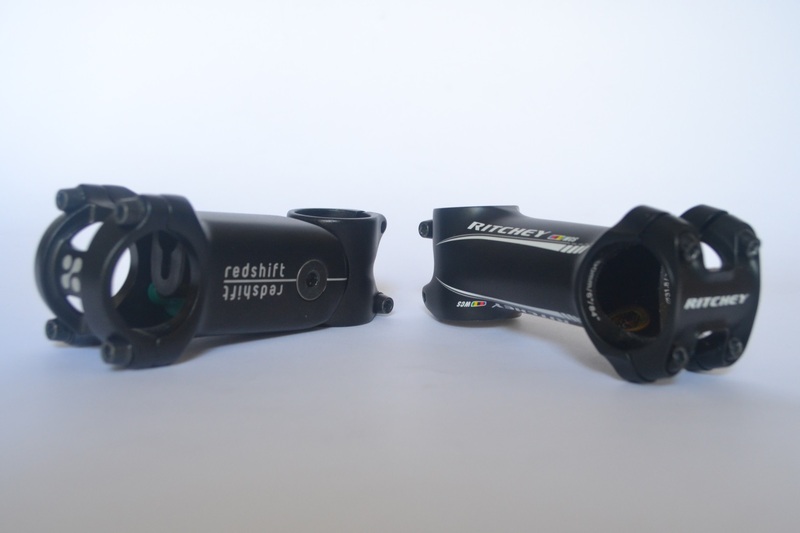 One of them is just this stem, able to effectively dampen and to allow a higher step. Well, I made the same mistake again, going straightaway to the conclusions. Be patient, first, let’s take a look at this stem, let’s discover the principle of operation, how we install it and then we will finish with the road test, that, I announce in advance, was very complex and varied. If you look at it “from outside”, you cannot imagine is a cushioned stem; to the inattentive observer it can look like a simple folding stem. 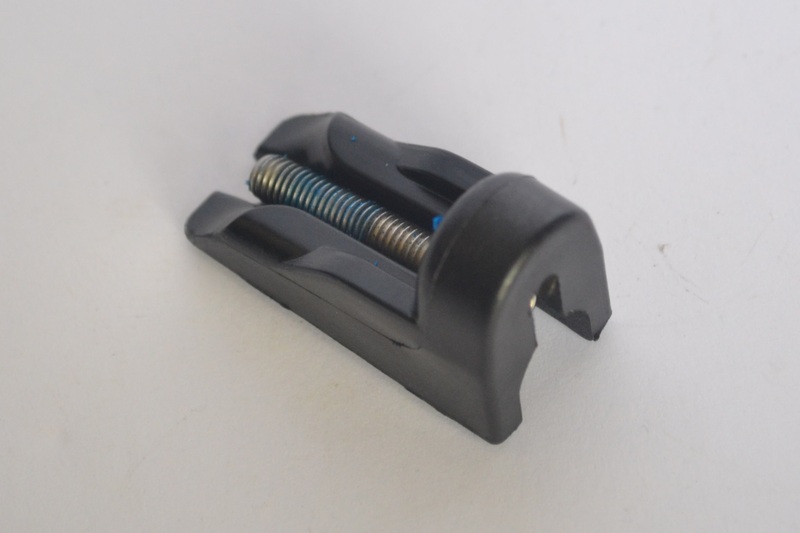 When we look better, we appreciate the structural quality and the excellent manufacturing, with the company’s logo unobtrusive, the classic indications on the correct clamping pairs, and that Allen screw well embedded that doesn’t indicate its actual working. Confronted with a classic traditional stem, the only noticeable difference is the square section of the body and its being a “little chubby”. The principle of operation is simple in its mechanism and for this intelligent. 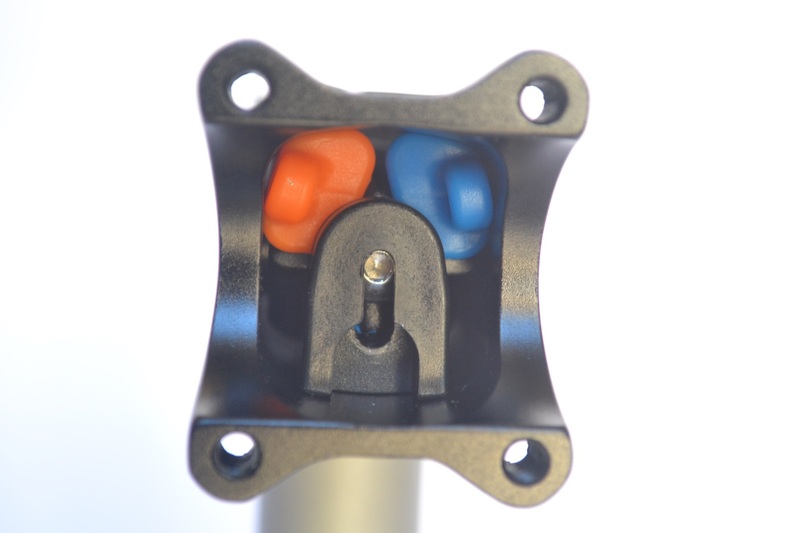 A single pivot works with the aid of an inner bearing located just next the Allen screw holding it in place; inside the main body, we have a pair of elastomers, which are delegated to the damping function. 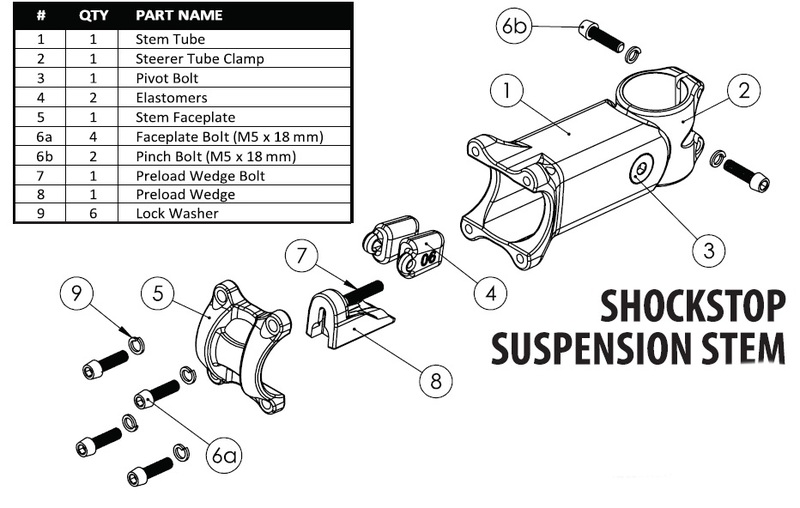 In this official drawing, the stem, dismantled in its parts, is visible, except for the bearing; which is in any case in the standard format and therefore easily available if you need to replace it. But tests conducted by the manufacturer were long and stressful and showed an effective life of the components very durable, so the replacement seems a remote event. 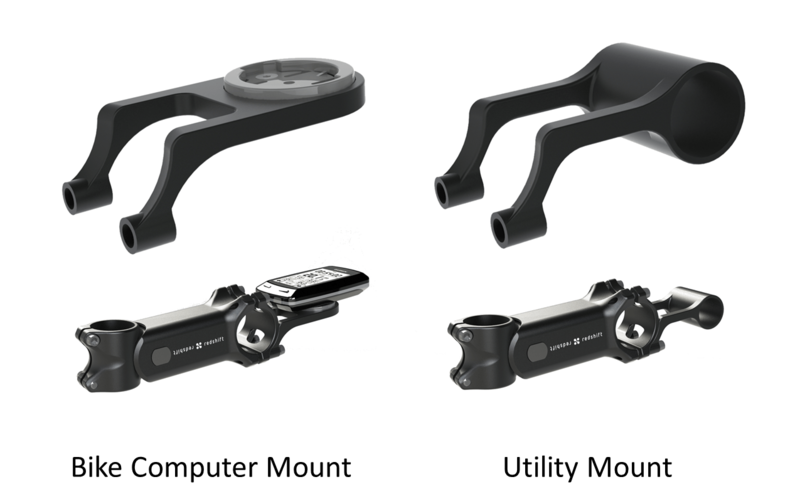 This pivot system with elastomers, causes the stem’s main body moves up and down “in a arch”, absorbing the bulk of the irregularities; and, in this way, they will not propagate along arms, neck and back of the cyclist. 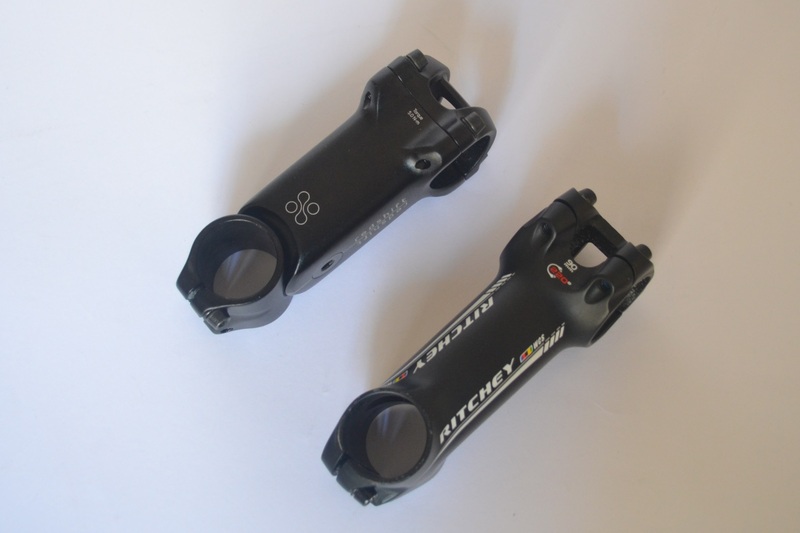 The official graphics clearly report the differences in behavior between a normal stem and this ShockStop. 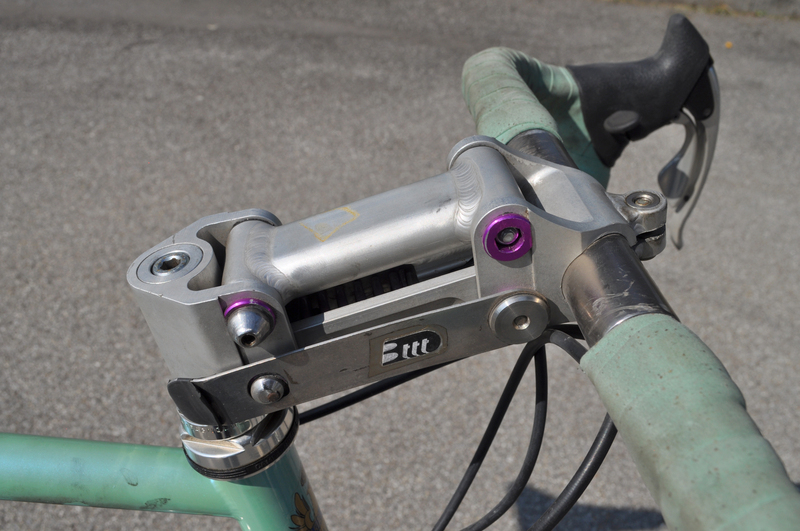 Like any self-respecting damping system, this is adjustable too. 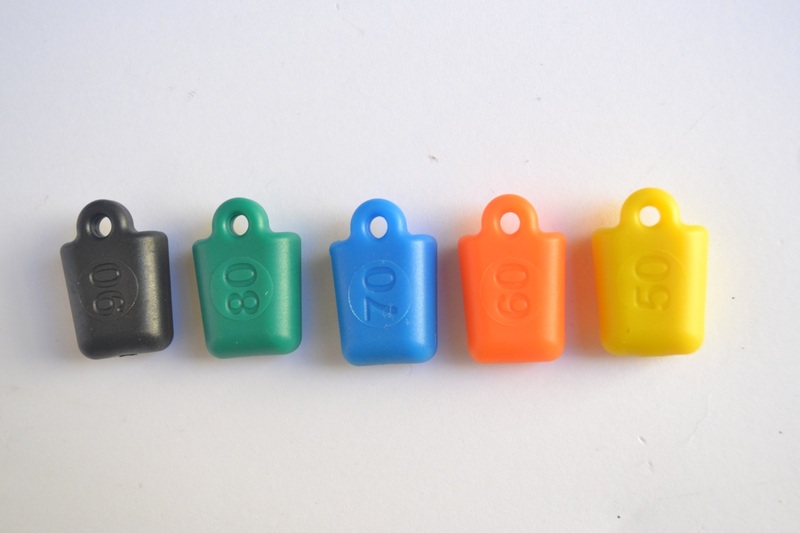 Production model is provided with five different elastomers, with different elasticity, easily distinguishable by color and gradation engraved on the body. 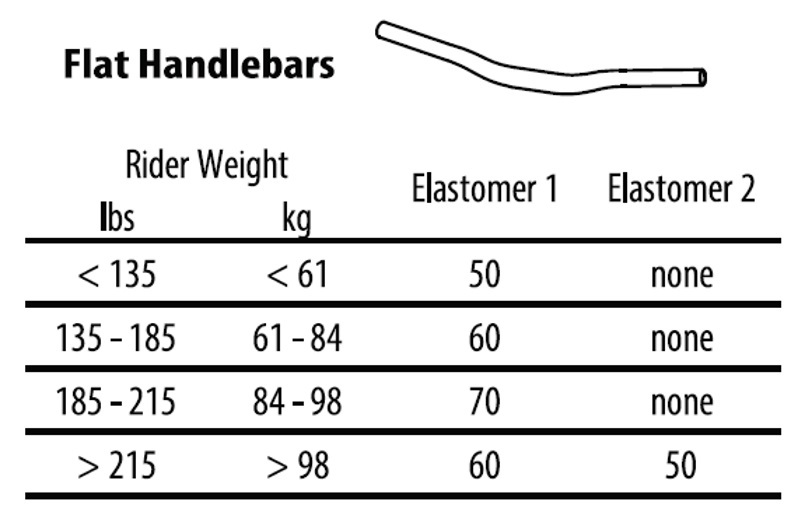 They will be installed single or in pairs, depending on the weight of the cyclist and the conformation of the handlebar, as shown in the table included in the instructions. Installation is simple, but less than shown in the official website. However the replacement of the elastomers is not so difficult if you follow the correct procedure. I will show it both in a photographic sequence with the support of the explanation, and in a short video. It is important that this operation must be performed with the stem already attached to the fork and we will see why. 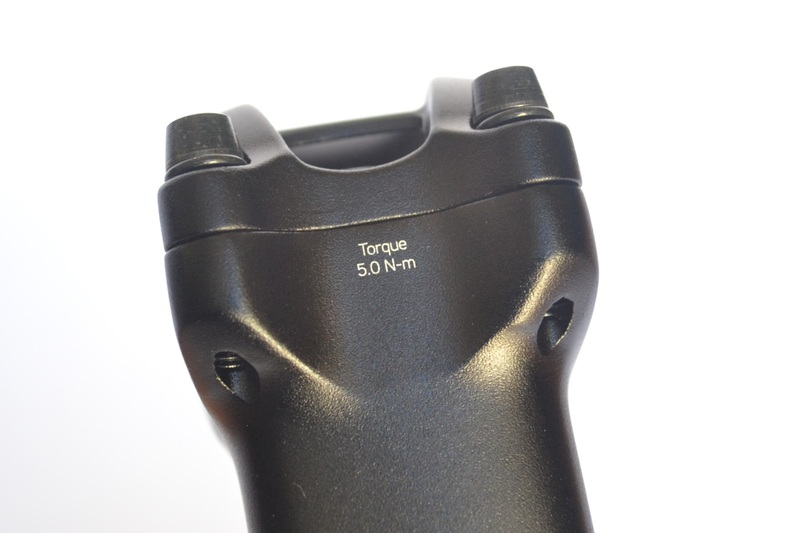 The required tools are two Allen screws, one 3mm and one 4mm. Long, handle version, even better if in a “T” shape. First we need to remove the cart that holds the elastomers, and we will do it by unscrewing the small 3mm Allen indicated by the arrow. After having completely removed the cart, with the help of our Allen wrench, we must pull the elastomers, using the ring, wisely provided by the manufacturer. Thanks to the table in the instructions, we will be able to immediately determine which and how many elastomers we must insert. 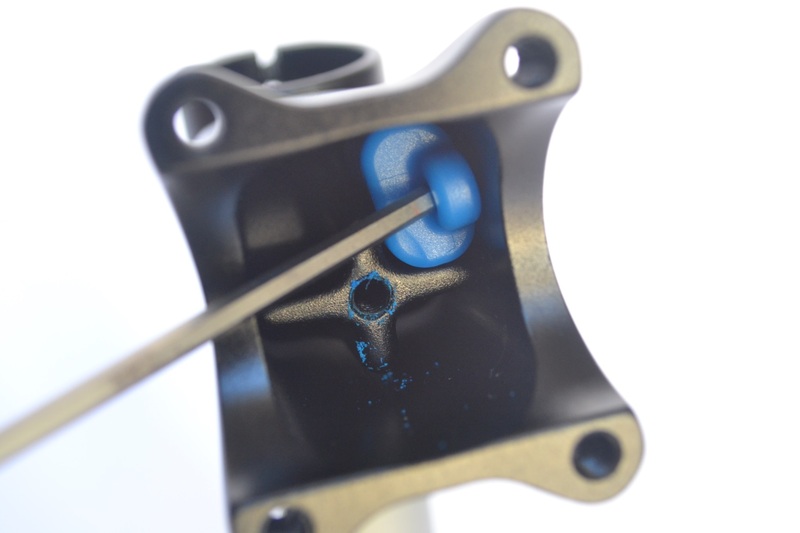 The direction of the insertion is very important: the rings must always be laid on the walls of the stem body and in the upper part, as it is specified in the leaflet. I added the red marks to symbolize the rings. Now we just have to screw the cart. 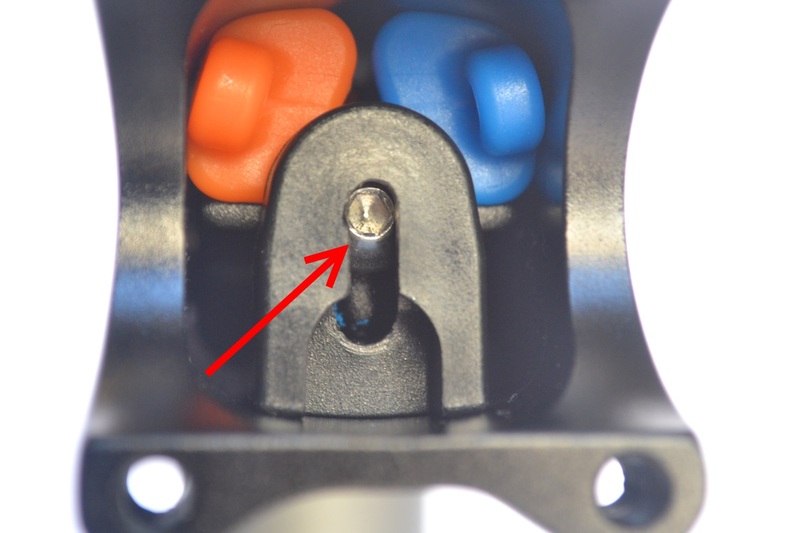 Even here there is an important indication: when you screw the cart, the stem body must be pressed firmly down and kept in this way until thoroughly screwes, otherwise you have the malfunctioning of the stem and the possible break of the internal screw. A nice “press” and 32 complete turns o the small 3mm Allen to put back the cart in its working position. This is why I stated above that it is necessary that the stem is already attached to the fork, and I suggested an Allen key with a handle or in a “T” shape, easier to keep tracks of the turns. In the following video there is the replacement of the elastomers. 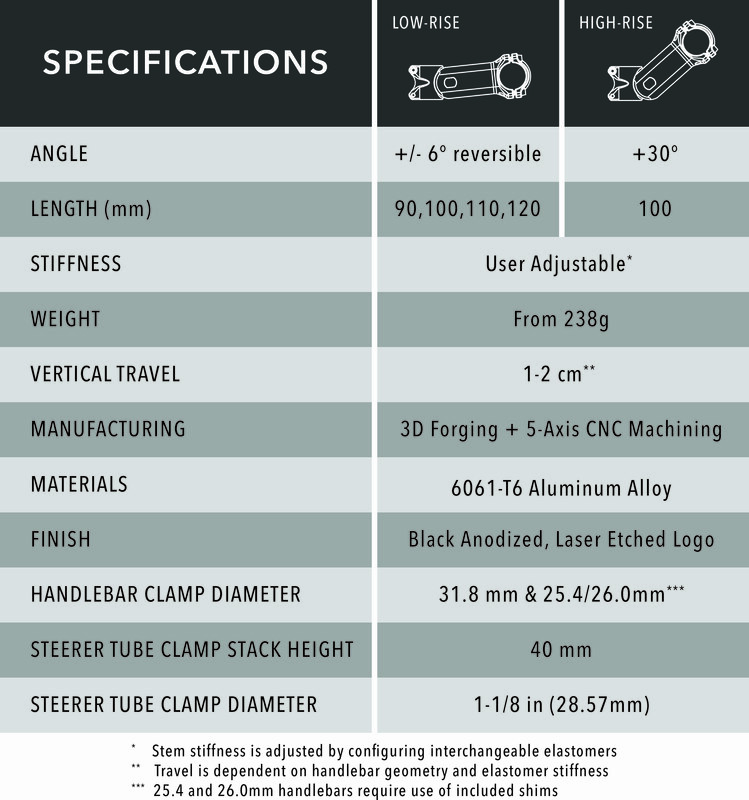 The stem comes in different lenghts and with different angles, as specified in the table below. As you can see, that one with 6 degrees is reversible. The important thing is, if you decide to turn it, to move the elastomers in the “cells” at the top, otherways it does not work properly. 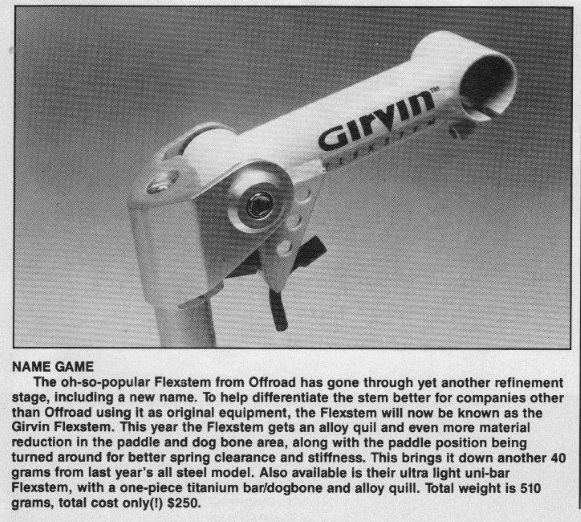 In addition, there are two useful original accessories: an attack for bike computers (standard Garmin) and a support for the lights, and more. Well, this is the end of the lenghty presentation, but we are not looking at a simple stem, and it deserves a thorough description. Now let’s move to the road test. Only Ellesar has been ezxempted, because of its handcrafted attack, I would have to remove the tape and levers to remove the crease and then taping again. Too much. The first test was riding my Rose X-Lite Team, an extreme sport bike that has its best feature in its forecarriage; its worst side in the little comfort on the paved road, which is why each my going out (which are numerous due to the circumstances unless I fly …) ends up in an agony at the beginning and at the end, that is when I am forced to pedal at a walking pace on the mangled roads that allow me to leave the city and re-enter. To accentuate the “hopping” effect on the paved road I also inflated the Michelin Pro4 Endurance tires, size 700×23, mounted on Spada Oxygeno at a pressure higher than the right one for my weight. 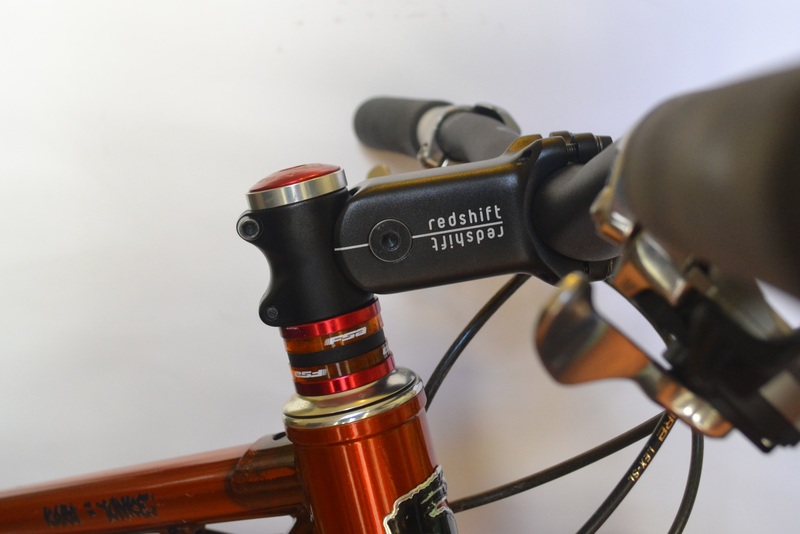 I was skeptical, after installing the stem on the bike, and having tested the range at a standstill, I was ready to see an unstable bike, with an unsteady handlebar, and without the absolute steering precision guaranteed by the perfect fork of the X-Lite. It was all wrong! A few hundred meters and I thought I had the tire at low pressure; I get off the saddle, check, the pressure is over the right threshold, another hundred meters and I stop again to take the bike of my going out’s buddy and give him the Rose. This to hear his opinion and to check if they fixed the road during the night, turning it into a smooth pool table …. Skepticism passed quickly as the pace on the paved road I never could keep. Posture to graze the saddle (there is no damping system) and I go pedaling on roads that I usually cross at a barely tourist pace. The handlebar never flaccid in my hands, I can feel the stronger shocks but they are dampened and I realize that I’m at a pace that without this stem I could never keep. I continue my test on uneven road, facing an uphill all paved and full of humps, and even here the pace is high, much higher than I usually Keep. I often get up to fling again with my hands gripping the levers, just to understand if you can feel the lowering of the fold when you weight forward. It’s minimal, you get used to it immediately. The steering precision never fails and this is fundamental. Having reached the top, I prefer to face the same downward path, then I insist on the paved road. Having had once again the confirmation that the average speed is higher and only the rear axle jumping right and left on the cobblestones forces me to lower the pace. I climb again on the top, to face a steep and asphalt descent: my aim is to verify the drive accuracy and the feeling transmitted when you brake, both in low grip and holding the levers. Once again the pace is higher, you don’t feel the asphalt roughness and when you brake in low grip, the handlebar stands firmly in your hands. When you reach fast a curve, holding the levers and firmly operating the brakes, you feel a slight lowering of the turn, something like when, riding a motorbike, you resolutely outdistance and the forecarriage squats. The entrance’s precision and the ability to keep the trajectory are not affected at all: the X-Lite was granitic before, it stays granitic now with this stem. Its lowering in braking does not affect the entry into the curve in any way (the steering geometry does not vary, the stem is amortized and not the fork) and you get immediately used to this behavior. Indeed, the real problem is that you get used too early to this stem, ending up by forgetting it is there. Except that you realize how valuable is as soon as you give it up. Which is what I did at a later going out, crossing the same distances with the rigid stem and then, immediately, going again with the amortized one. I preferred this continuous mounting and dismounting precisely to avoid spending too long time between a going out and another. I wanted the immediate comparison with the same bike and the same road. And every time the ShockStop proved a success. More speed, more comfort, no limits in riding accuracy. I started to go on purpose over manhole covers, rails, humps, dips, various jumps (yes, with the Rose X-Lite, and then somebody says that carbon is fragile…), looking at every opportunity to discover some limit or some defect in this stem. All in vain, the more I dared, the more this holy stem indulged every weird interpretation of the road I had. Obviously, after such extreme tests, the behavior on normal asphalt was simply excellent, transforming by magic every imperfection into a perfect road surface on which letting slide the front wheels. And pouring some of this great efficiency to the rear too, albeit in an indirect way. Being able to ride with your arms and your back that “suffer less” and remain soft, allows you to better hold the bike in trajectory on protruding uneven roads. Furthermore, the whole trunk is less weighed on, so it’s easier pedaling close to the saddle in order to damp with your legs. It was not easy to interpret this behavior, to be able to decipher your feelings and connect them in the right sequence. The objective fact is I went faster and with less effort, right where I am usually forced to drop drastically the rate in an attempt not the be unsaddled. On racing bikes, I am sensitive to the weight, this is something that I do not neglect. Without any excess, especially for my wallet, I look for the lightness. 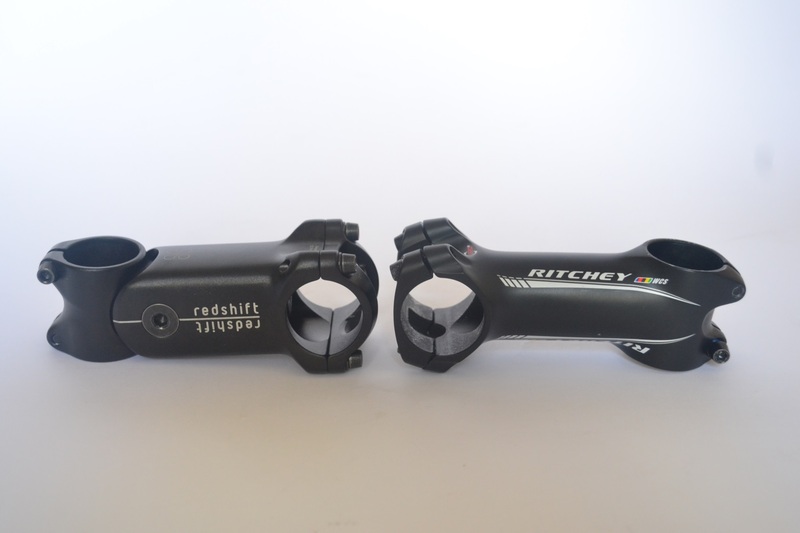 But I added with pleasure the 110 grams that separate my Ritchey from this ShockStop that, in 90mm length, weighs 230 grams on my scale. It will be tough to send it back now I’ve finished the test…. The second test was performed using a multi-purpose urban/gravel one, the PlanetX London Road, which has an aluminum frame, carbon fork and wheels wearing some bulging tires size 700×35. I covered the same roads where I cycled with the X-Lite, adding some city traits particularly mangled and various off-roads. 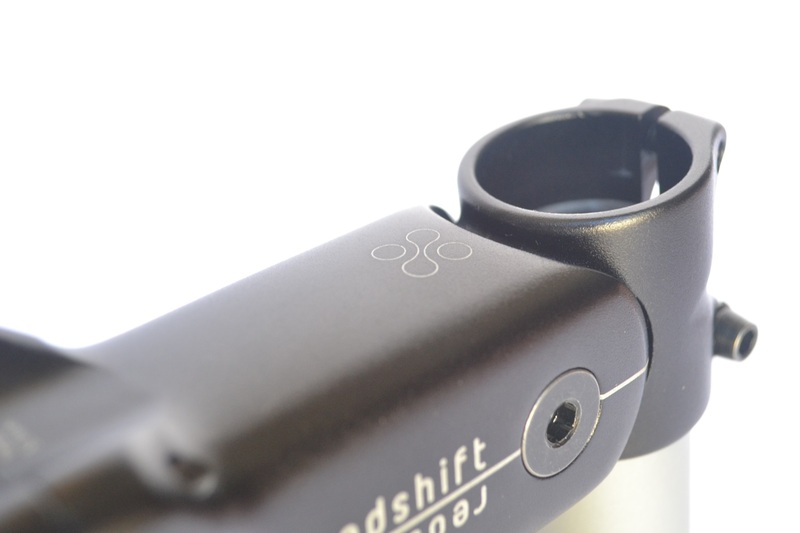 Even more than with the rigid sport carbon bike, the ShockStop showed its qualities right here. 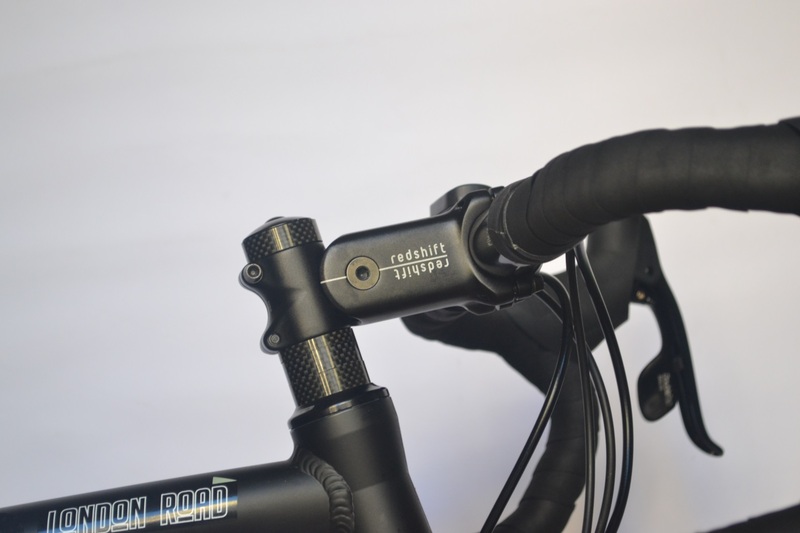 Thanks to the big tires I can cycle more smoothly on bumpy roads, but – after having installed this stem – I was able to cycle blithely, increasing the pace, on those traits where I was forced, even with the London Road, to slow down, engaging a though speed in order to keep the bike loaded on the road. Especially downhill I felt the overall improvement in the roadholding and in the ride comfort. Both on and off road, I replicated the scheme to cycle the same traits with a rigid stem and with this amortized one, to clearly see the differences and fix the impressions. In the city, with badly paved streets and a lot of damaged paved roads, I was able to keep a pace that was impossible with a rigid stem. The same, off-road, where every path, jolt, root, jump, was always faced at a higher speed without never spoiling the excellent steering accuracy of this little multi-purpose English bike. Going downhill fast gripping the levers, thanks to the disc brakes too, you can feel even more the lowering of the fold, in a sharp braking. But how it was on the Rose, on this London Road also, only few meters were sufficient to get used to it, and even with this bike I did not feel any deterioration in driving accuracy. The third bike involved is an old acquaintace of this blog: the Surly Karate Monkey Ops with steel frame and rigid fork of the same material; it was lent to me in its current version, that is with flatbar, Spada Rapido wheels and 2 inches large Big Apple. 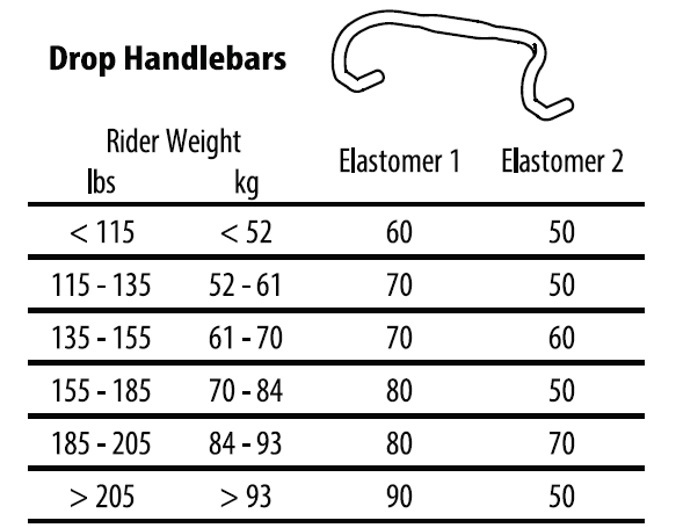 You may have noticed that the setup of the elastomers is very different between the flat handlebar and the drop bar. In my weight class I had to install only one, of medium level, and frankly I didn’t know what to expect. And, in order to gather as may data as possible, I rode the bike with the Big Apple and with thinner covers, riding on the same roads and the same off-roads faced with the other bikes. 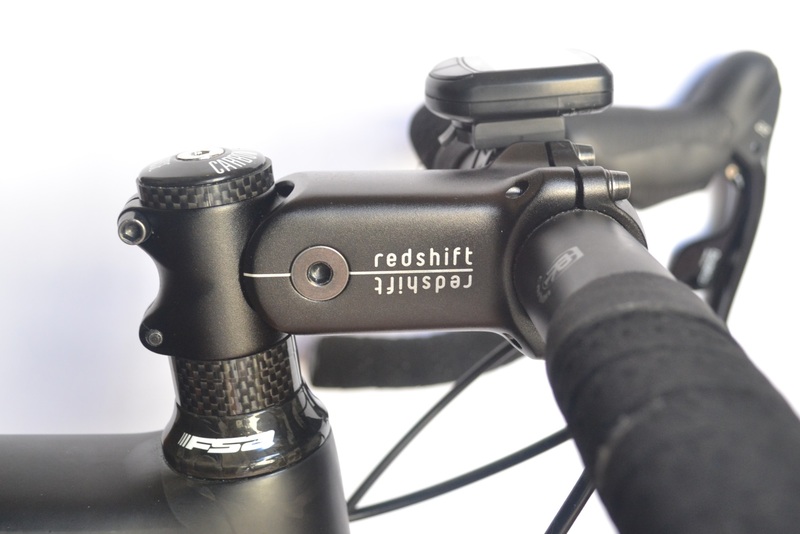 In this configuration and with this Surly, the handlebar became “softer” than in the tests with the racing fold. 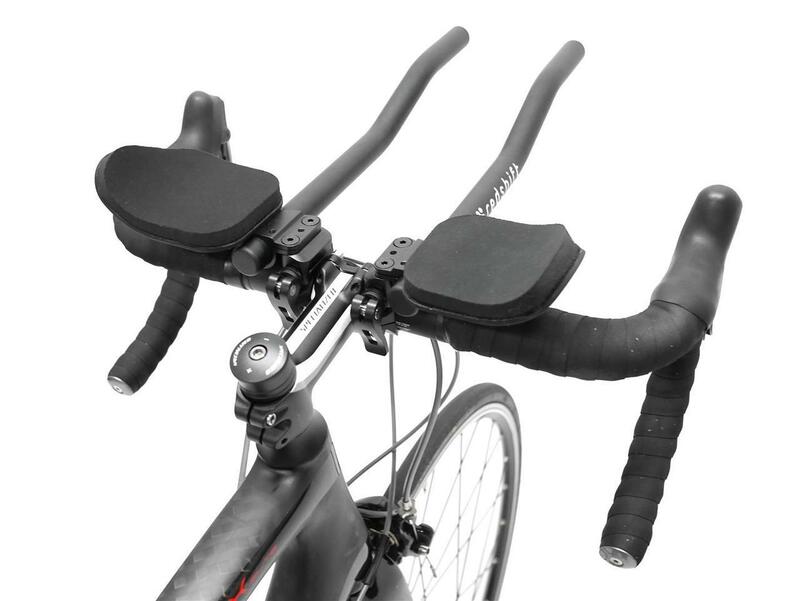 Especially at low speed and on the more pronounced protuberances, always faced at a lower pace, you can feel with higher intensity the up and down of the handlebar. Soft but not flabby, mark my words! Increasing the pace, my feelings were leveled to those registered with the fold, therefore an overall increase in ride comfort, the possibility of increasing the pace (especially with the narrower tires, the Big apple are so comfortable that alone suffice…) and all it without ever sacrificing the forecarriage’s accuracy. In the following video, you can see some typical situations riding the PlanetX London Road; off-road, asphalt, paved road, both on platform and downhill. You can note the movement of the fold on rough ground and how it goes down when you brake. None of this was enough for me, I wanted to carry out further tests by changing the setting of the elastomers on all three bikes I used. With my 71 Kilos, I am at the first limit of the expected range , running from 70 Kgs. to 84 kgs. So I run some tests, always on paths and used bikes being equal, using the combination of elastomers planned for the lower and upper weight range. The test with the setup scheduled for a weight category higher than mine did not produce significant results. The lowering of the fold is less pronounced in heavy braking, but other than that the stem could not deploy its qualities. Too rigid and with the annoying tendency to hop on the roughness in a rapid succession. Especially on paved road, the wrost evidences with a “resonance effect”, whereby the handlebar, both drop and flat, continued to vibrate in my hands. No, it was a mistake, but I had to verify it. I obtained more interesting results pedaling with elastomers intended for the lower weight class. I did not like it with the straight handlebar, the lowering in heavy brake is too sudden, while in milder brake, everything remained in control. With the fold I got two different answers on the two bikes I rode, and it should be remembered that they are very different. The riding comfort increased but, while riding the London Road I had no contraindications in any difficult situation (just the usual lowering more rapid when you brake), with the X-Lite I had some indecision in the fastest descents, especially in sharp U-bends, holding the levers, where I had some failure entering into the curve; probably the load change, in fact, when I applied the brakes in a lower grip, the problem has almost vanished. Nothing dangerous, and only at a dangerous speed, but overall I considered definitely better the setup designed by the manufacturer. However, on the worst stretches of the paved road I had a higher ride comfort, with all the bikes I used. 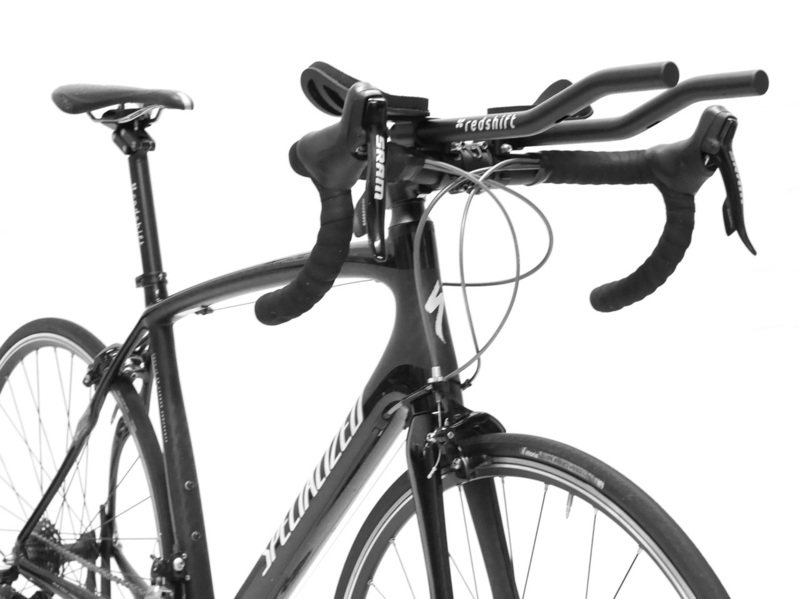 I missed a test that I wanted to do, but I had no chance to get in a short time a suitable bike: in alignment with the time trial appendages, as these Quick-Release Aerobars, also manufactured by Redshift. If you use them or have used them, then you well know the bumps are resolutely transmitted on your forearms and amplified by the tight grip on the appendages. 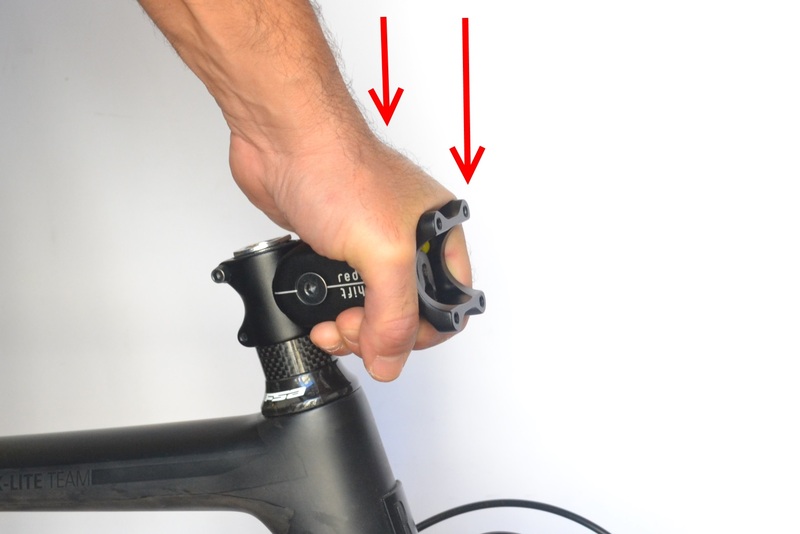 I am fairly convinced, after many tests, on a bike so configured, this stem could be an excellent solution. If Redshift would place them at my disposal, I don’t draw back. A long review, I believe the most comprehensive in the web. But you know that I prefer to be generous with the information than sacrificing the completeness to the speed imposed by the web. Now we are at the final thoughts, keeping an eye on what this stem offers, also in connection to its price, for the time set at 139USA $. 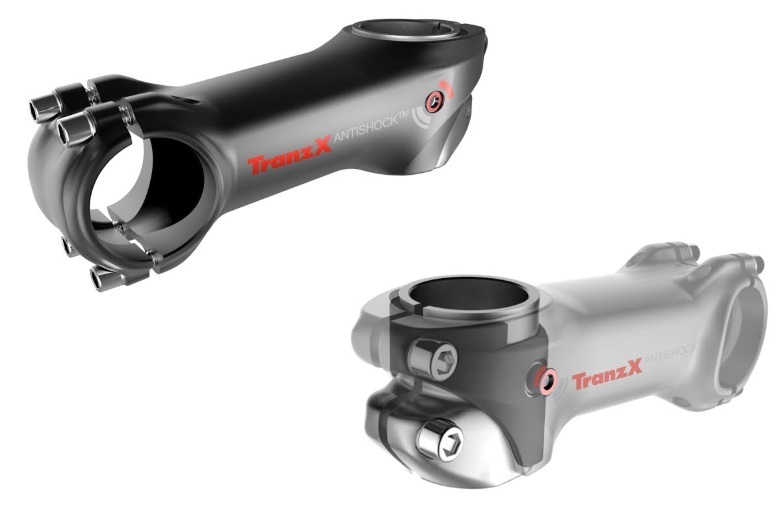 Which at current exchange rate, it’s more than it takes for a good rigid stem in aluminum and much less than the price of a carbon one. Money well spent? Yes, absolutely. Whatever is the bike, obviously fitted with the rigid fork, the overall improvement is tangible, real. No contraindication in driving accuracy, only in that lowering of the handlebar when you brake, otherwise you would forget to have it. 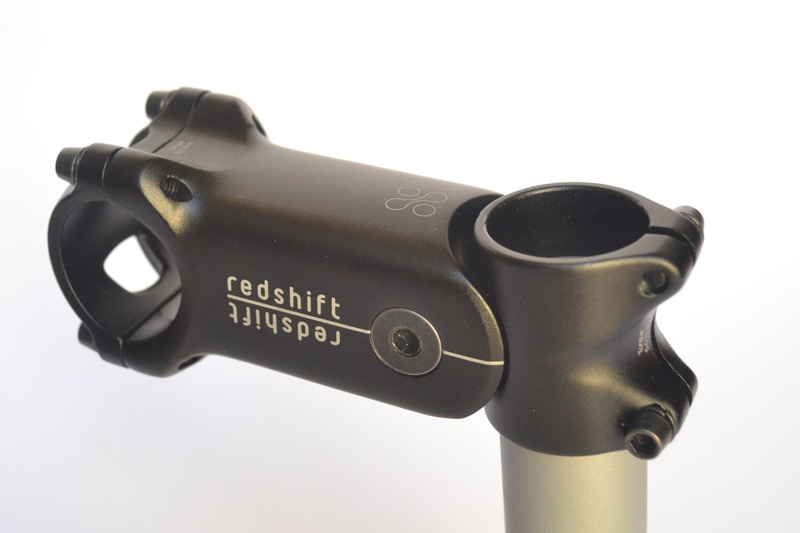 And then, if you reinstall a rigid stem, you will regret it. The few grams more do not represent a limit, placed then in an area of the bike where they don’t affect so much as they would do instead on the wheels. It remains to determine the constancy of behavior over time, over the years I should say. 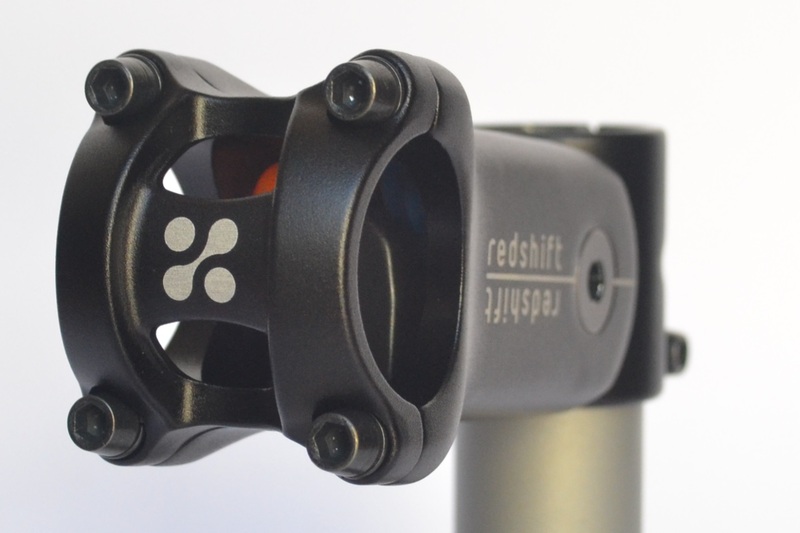 Redshift performed many tests in the laboratory and assured me that the life cycle is long; and let’s not forget you can change both the bearing and the elastomers, if the wear would degrade its functionality. 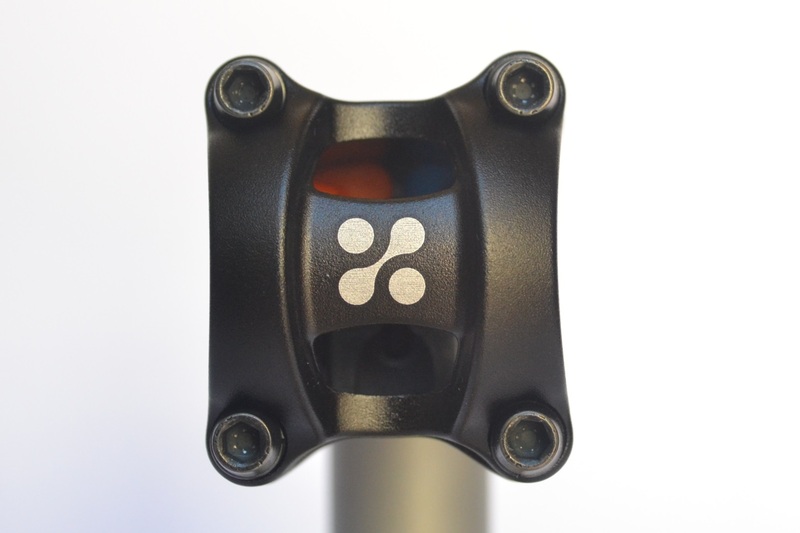 Sport cyclists, urban ones, tourists, off-road riders without amortized Mtb, this stem is for all of you, and each of you will take advantage of it. I could use the sport Rose X-Lite as I was not allowed with its stem, I always kept a greater pace, on each road and on each bike. Skeptical and disenchanted when I saw it, it only took a few kilometers to radically change my mind. It is not just the speed that increases on rough roads: it’s the enjoyment of the bike, any bike, that makes a decisive step forward in every occasion. 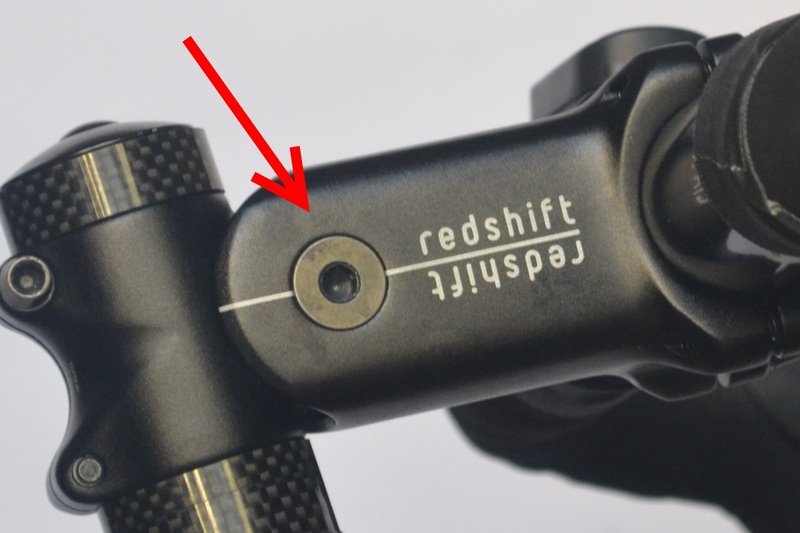 If the limited finances of the “bike account”, perpetually in the red because the blog costs and the micro-workshop, will allow me, it is for sure that a ShockStop will find its home on one of my bikes. How did Redshift Sports get started? 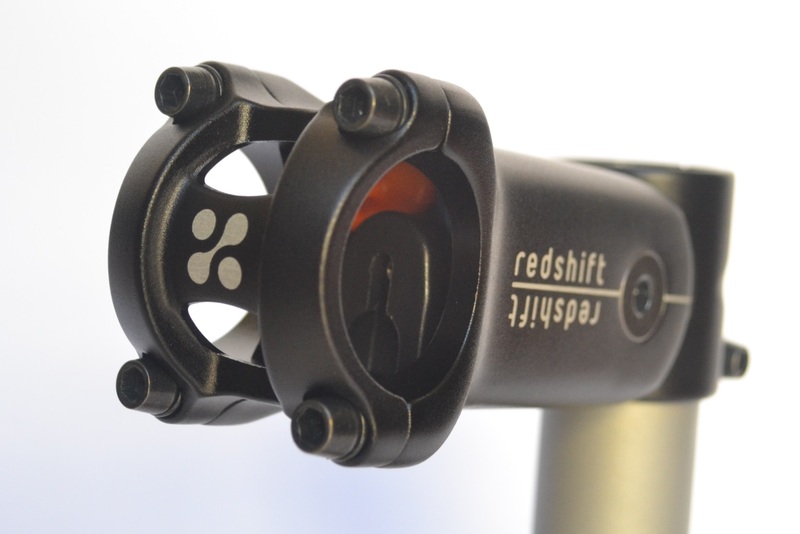 Redshift Sports was founded in 2013 by three mechanical engineers with the goal of making innovative products to help cyclists and triathletes go faster and get more enjoyment out of riding. Prior to founding Redshift Sports, the three principals: Stephen Ahnert, Erik deBrun, and Scott Poff ran a very successful product development firm. What was the first product that you created? 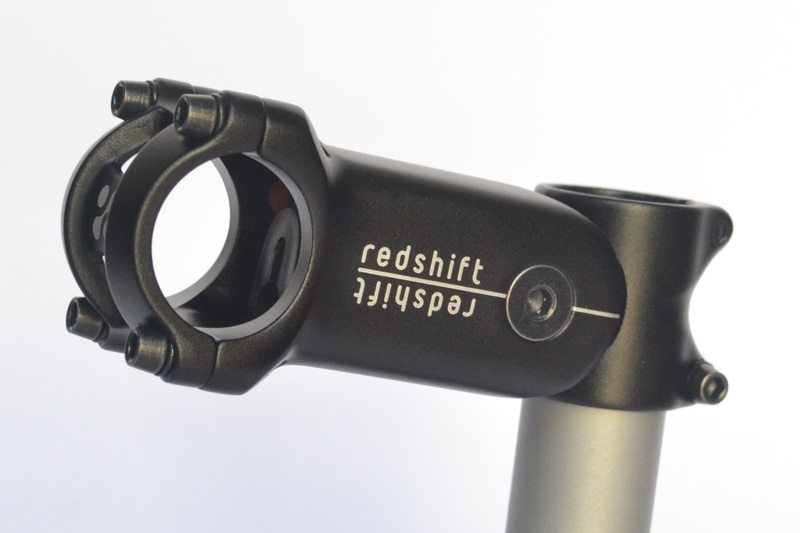 In June 2013, we launched the Switch Aero System on Kickstarter, a crowd-funding platform that lets independent backers jump-start small businesses and projects. The response was overwhelming and we raised 2.5 times our original funding goal. 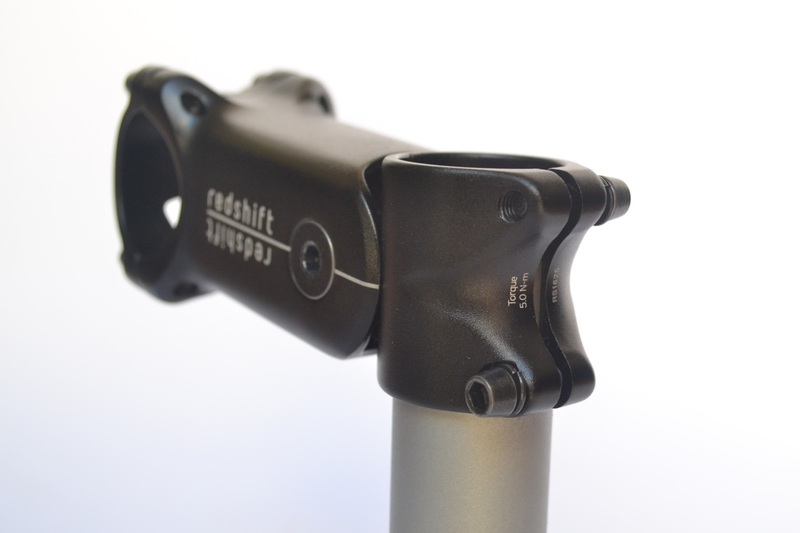 This enabled us to bring our first products to market: a dual-position seatpost and quick-release aero bars. 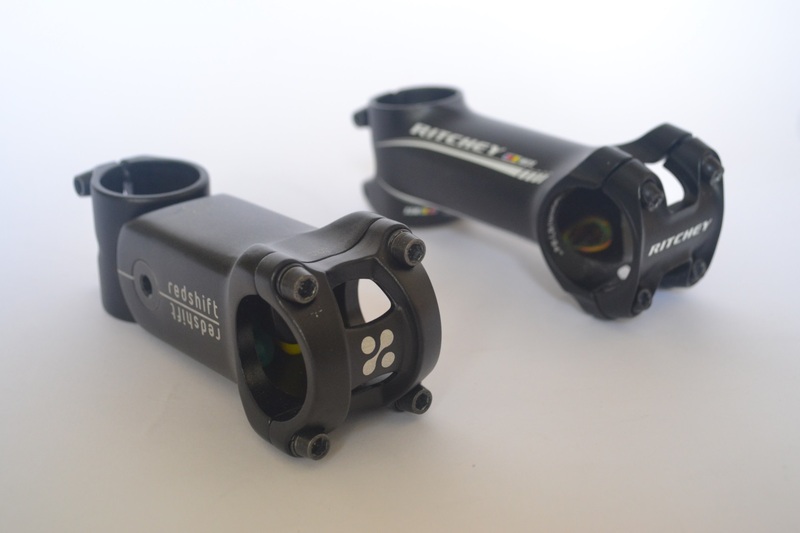 Together, they form the Switch Aero System which lets riders switch back and forth between an aero and a road position without compromising fit or comfort in either position. What tests do you carry out prior to bringing a product to market? We do extensive testing before we bring any product to market and we continue to test after to learn where we can make improvements and to ensure quality. 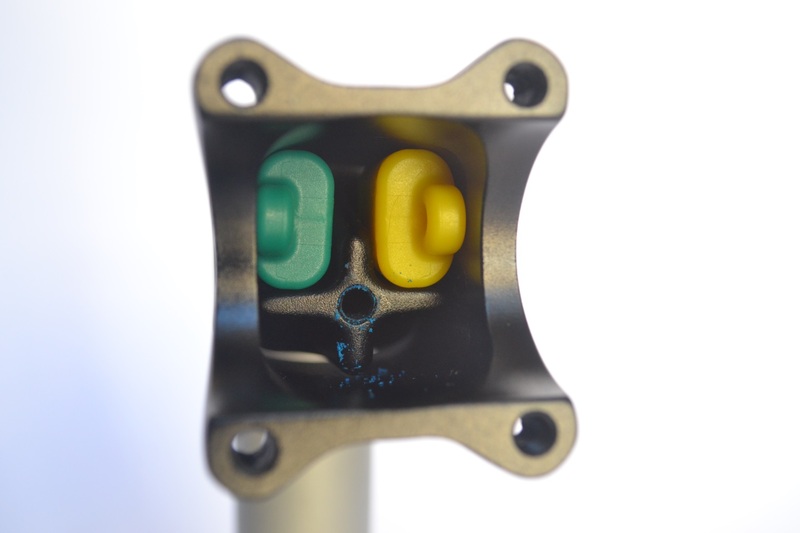 For the ShockStop, we have tested it to the same ISO standards as a traditional stem, including in-phase (up/down) and out-of-phase (twisting left/right) fatigue loading, as well as a series of static load tests. 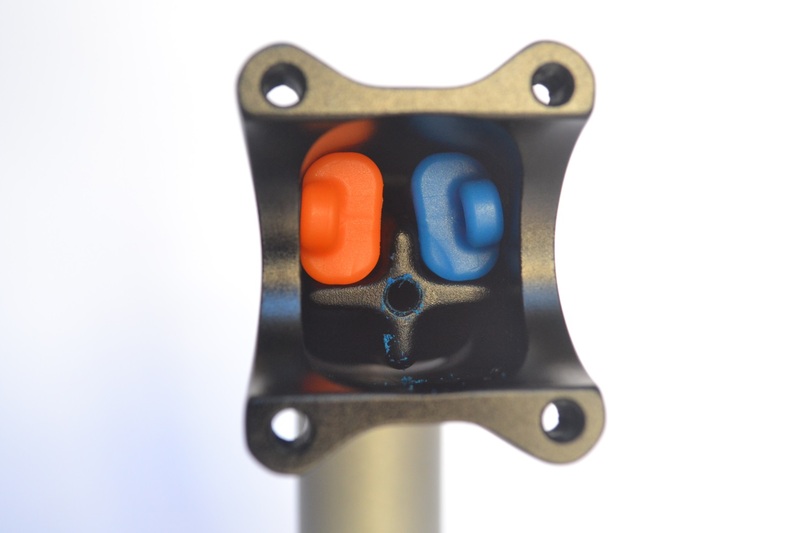 In addition, we have a number of internally developed tests that subject the ShockStop to impact loads and other conditions that simulate real world conditions to ensure that it holds up to years of riding. To achieve the objects you turn to outside companies or do all of you in the USA? We work with manufacturers both in the USA and in Asia. We have great partners who have extensive experience in the bike industry which is very important when you are producing completely new and unique products. Are you working on a new project? If you are, you can anticipate something? We are actually working on a few new products. I can’t say too much about them except that our customers should be really excited for what is to come. We love working on new and innovative products and are always listening to our customers to learn about what they want.